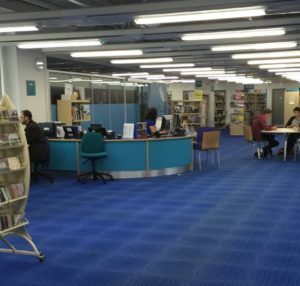 On arrival at Cambridge Central Library, head up to the 3rd floor help desk and let the staff know you are here for a DSA Needs Assessment with Access2Learn. The car park postcode is CB2 3QF. Cambridge is serviced north to south by the M11, and east to west by the A14. As you come into the city, follow the signs to Grand Arcade. There is a multi-storey car park adjoining Grand Arcade. The city centre can be very congested and one of the easiest ways to reach Grand Arcade is by the Park and Ride. There are five Park and Ride locations around Cambridge with regular buses into the city. The locations are; Babraham Road, Madingley Road, Milton, Newmarket Road and Trumpington. The cost to use the Park & Ride is £2.70 (valid for 1 day) and it will cost you £1 to park up to 18 hours. There are regular trains to Cambridge from London’s King’s Cross, London’s Liverpool Street, Norwich, Kings Lynn and Peterborough. Grand Arcade is a 15 minute walk from the station or there is a regular bus service to the city centre from the train station. For train times to Cambridge click here. There is an extensive network of buses that serve the city centre and stop at the interchanges of Emmanuel Street and Drummer Street, just outside Grand Arcade. For more information on buses in Cambridge click here. There is a free bike-park for approximately 500 bikes run by Station Cycles just outside Grand Arcade on Corn Exchange Street. Station Cycles at Grand Arcade cycle park, offers a secure parking facility, hire station, and full repairs workshop as well as a fully stocked cycle shop. Grand Arcade is located at the heart of Cambridge city centre. We are bordered by Downing Street, St Andrew’s Street, Corn Exchange Street and Lion Yard. Google maps can be relied upon to plot good pedestrian routes to the centre from a variety of locations within the city.